Since these performances began 1,000 years ago, it is perhaps a little inaccurate to say they were inspired by hollywood horror movies. But ignore the time line, and you have a vast number of creepy dolls hiding in your bathtub. It is a plot combination to put 'Alien vs Predator' to shame. Beginning in the 11th century, water puppet shows were created by Vietnamese workers in the flooded rice fields of the north of the country. The water acts both as a scene for the story and as a tool to hide the puppets' mechanisms, which are controlled via long poles at their base. These poles are made from bamboo while the puppets themselves are made from wood and lacquered to protect against water damage. They are actually pretty heavy, weighing up to 15 kg per puppet. When in-action, the puppeteers stand waist-deep in water with the puppets, but are concealed from the audience by the stage screen. The acts of the puppet play are set to music, played by a live orchestra on traditional Vietnamese instruments. The most unusual of these was the 'dan bau' (actually written with a truck load more accents than I can figure out how to add to the letters) that resembles a one string guitar (this is played by the lady at the front of the orchestra photograph). The pitch is controlled by a flexible rod in the muscian's left-hand. Upon looking up this instrument's correct name, I was further enlightened by wikipedia that it is traditionally played by a blind musician, in replica of the tale of a blind woman who first played the dan bau to earn money while her husband was at war. As far as I can tell, the musician playing at our performance did not fulfill this tradition, although it is hard to be entirely sure. Now no longer confined to rice paddy fields, the show we saw was at the Thang Long Water Puppet Theatre in Hanoi. The screen to conceal the puppeteers resembles the entrance to a temple and despite not being able to understand the Vietnamese, the show was amusing and impressive. The non-existance of a language barrier is undoubtedly important, since I did not see a single Vietnamese face in the audience. Interestingly, professional puppeteers for water puppetry are relatively recent, with the first state-run puppet troup created for public performances established in 1973. After the show, the nine puppeteers ducked out from behind the screen to loud appaluse. 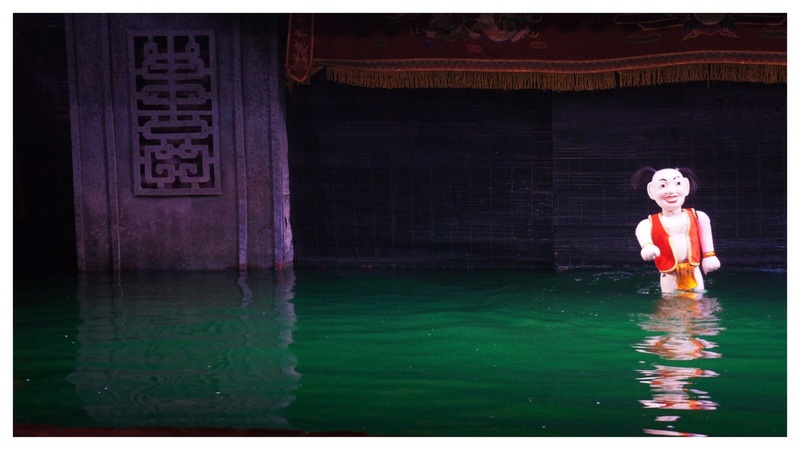 Hopefully, the water in the theatre is warmer than that in the rice paddy fields.